Enjoy our famous Buffet favorites delivered right to your special event, ask us about other available items and let us create a menu to fit your budget. Whether you're kicking back with family and friends, or planning a formal affair, Golden Corral Catering offers expertly prepared food and outstanding service that will make your special day simply delicious. On-site catering requires a minimum of 30 guests. 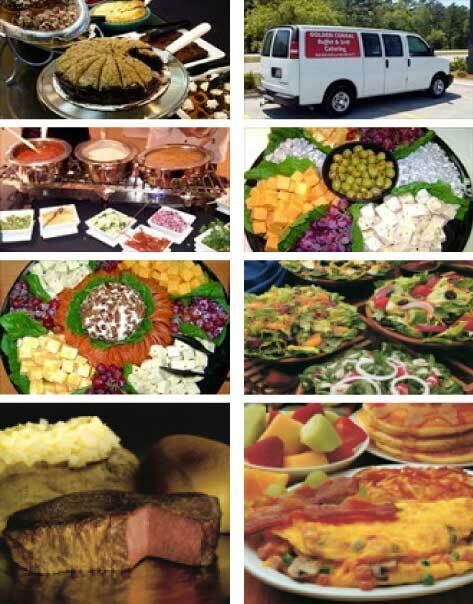 Along with your catered meal we will provide plates, napkins, utensils, and cups. Priced to include gratuity, delivery, buffet line set-up and clean-up. Price does not include table service or dining area clean-up. Tax is not included. We will bring enough food to ensure adequate servings, however all un-served items will leave with us. All pick-up and delivery items are priced by the pan. Serving sizes depend on selections. All items are packaged in disposable pans. A delivery fee based on order size will apply. A minimum of 72 hours notice with a $100.00 order required for delivery. There is no additional charge for items picked-up at one of our restaurants. is available at your place!